Mwahahahaha! My name is Lulu and I've taken over this blog from my mummy & daddy. They don't know that I've commandeered it, in fact they don't know that I know anything about blogging. You see, I'm only 17 months old and they clearly underestimate my technology skills so I've decided that I'll be keeping this blog up to date from now on. Mummy & Daddy can concentrate on their garden design blog coz this one's mine! So what'll I write about? Well, mummy & daddy (from now on I'll refer to them as M&D) run two gardening businesses and love everything to do with gardens so from a very young age (I'm a big girl now, did I tell you I was 17 months old??) I have been out & about in gardens whether it be visiting them, tending to them or even designing them! 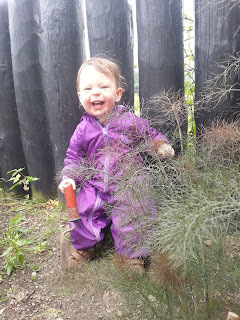 The long & short of it is I'm beginning to garner quite a nice set of green fingers (and not just from my crayons) so I thought I'd use this blog to share the things I enjoy doing or the things I learn. I'll show you pics of the gardens we visit (M&D are always taking pics of me so I'll have plenty to choose from!) and tell you fun ideas for things to do with your mummies & daddies & friends in your garden. Sometimes I will give you advice and tell you things that only experts like me normally know but mummy says it's important to share so that's what I'm gonna do.